The history of ancient Kerala is closely related to that of the neighboring state of Tamilnadu. The State of Kerala was by and large a part of the Tamil cultural domain, during the rule of the Cheras, up to the 3rd century CE. The earlier cave temples of Kerala were influenced by the rock cut temple styles of the Tamil region. An indigenous temple architecture based on the the utilitarian residential types of Kerala and the Konkan region originated later in Kerala. Finding expression in a mixed medium of stone, brick, laterite and wood this unique approach to temple building resulted in a distinctive form of architecture, laying stress on sanctity, simplicity and a prevailing naturalism which marked the worship in temples. This approach naturally leads to an old-world charm, not seen elsewhere in the Indian subcontinent. Bhagawati and Sastha are the most popular of the deities enshrined in temples. So is Sankaranarayana - the Hari-Hara manifestation of Shiva and Vishnu. Bhagawati is considered to be Narayani - or the Vishnu-Maya. Sastha is considered to be the son of Hari and Hara. Shiva and Vishnu are worshipped with equal devotion in Kerala, and there are no distinctions based on the sub religions such as Saivism and Vaishnavism as seen elsewhere. In fact, Anantasaayi, or Vishnu enshrined in a reclining posture, is depicted with a Shiva lingam below his extended right arm, unlike in Tamilnadu. The Shiva Vishnu synthesis in general modes of worship based on earlier Indian societies of the pre Christian era has been preserved in Kerala. 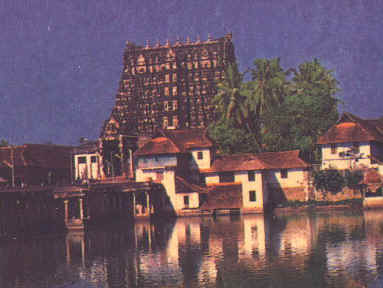 The temple culture of Kerala also stresses the importance of the ancient Indian epics. The temple culture in Kerala is based on Vedic moorings, in contrast to the Agamic traditions of Tamilnadu. The sustenance of ancient practices of worship, causes devotees to step into a different world upon entering the temple precincts. For instance, the use of oil lamps in contrast to electric lamps, lends an air of sereneity and mysticism to all Keralite temples. In contrast to Tamilnadu, the Keralite temple tradition focuses only on the deity enshrined in the sanctum (moola bhera) and has no importance laid on processional deities (utsava bhera). Most temples do not have shrines to the consorts of the presiding deities, although the concept of Bhoga Shakti prevails (see Tiruvarur in Tamilnadu). The earlier temples of Kerala were primarily for Shiva and Vishnu or their manifestations (Krishna, Parasurama, Rama, Vamana). Shiva is worshipped both in the iconic and the aniconic Linga form. Swayampradhana shrines to Ganesha, Kartikeya are of later origin, and are seen more in the temples of the peripheral regions of Kerala adjoining Tamilnadu or Karnataka. Inscriptions in Kerala are mostly in the ancient Vattezhuttu script of Tamilnadu. Malayalam inscriptions are seen from the 16th century onwards. Temples have been constantly rebuilt and renovated, unlike in Tamilnadu where more permanent structures of granite were built and engraved upon. The temples of Kerala are referenced in the works of the Tamil Alwar Saints and the Nayanmar Saints. Kulasekhara Alwar and Cheramaan Perumaal (one of the Nayanmaars)belonged to the Cheras of the ninth century CE. There are several works on temple architecture written in Kerala during the 15th and the 16th centuries. The Bhakti literature of the 16th century played an important role in the temple culture of Kerala.The Maharajas of Travancore were ardent patrons of temples.